Putin Signals He Will Sign Law Banning U.S. Adoptions Of Russian Children : The Two-Way Angered by an American law barring some Russian officials from entering the U.S., parliament members in Moscow have retaliated. 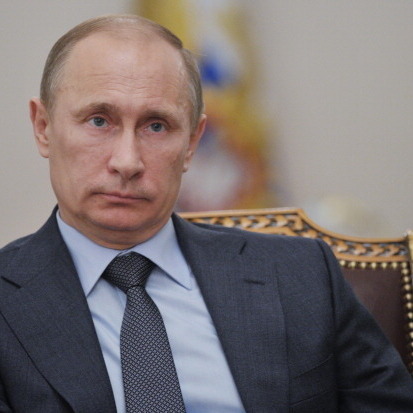 Putin has now said he sees no reason not to sign the adoption ban. More than 60,000 Russian children have been adopted by Americans since 1992, the State Department says. From the NPR Newscast: Michele Kelemen reports. Saying that he does not see "any reasons why I should not sign it," Russian President Vladimir Putin indicated today that he will approve legislation to bar Americans from adopting Russian children. As NPR's Corey Flintoff explained on All Things Considered, Russia's parliament on Wednesday approved the legislation, which is in retaliation for an American measure that bans some Russian officials from entering the U.S. or putting their money in American banks. That move by the the U.S., Corey said, was designed to "expose Russian officials who are alleged to have been involved in a massive tax fraud and the death of a Russian lawyer who ... uncovered that crime." The American action angered Russian politicians, Corey added. They decided to take aim at U.S. adoptions of Russian orphans because that's long been "a sore point with Russian officials. ...They see it as an admission that Russia can't take care of its own children." According to NPR's Michele Kelemen, the State Department estimates that more than 60,000 Russian children have been adopted by American families since 1992. The Associated Press adds that "UNICEF estimates that there are about 740,000 children without parental custody in Russia, while only 18,000 Russians are now waiting to adopt a child."